I have attended the Eau Thermale Avène #MorethanJustWater Luncheon recently just to learn more about Eau Thermale Avène. 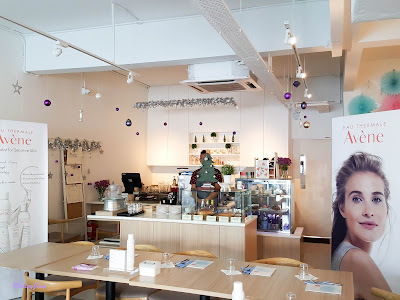 Thanks to Seeties and also Eau Thermale Avène Malaysia Team for the luncheon invitation at Nara Kitchen & Co. Thank you for having me there and gave me the opportunities to learn about the brand. 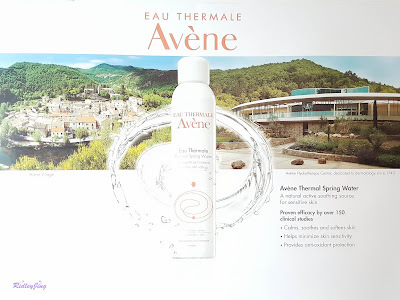 I guess most of the people are very familiar with Eau Thermale Avène because you can find this reputable brand at most of the drugstore such as Watsons, Guardians, Caring and so on. 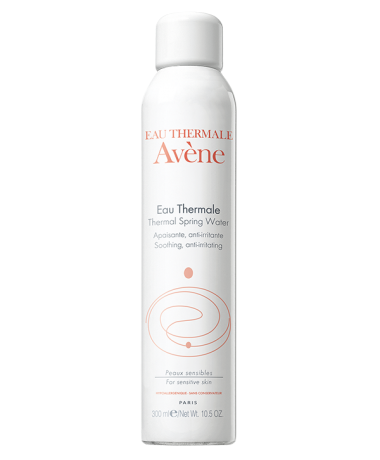 As for me, I really like their Avène Thermal Spring Water and I often used it to soothe and soften my skin . 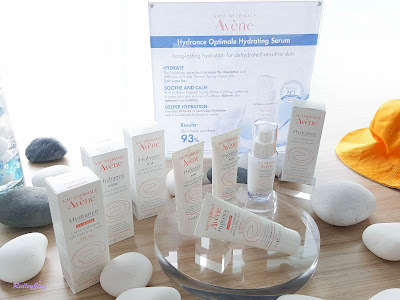 However, Eau Thermale Avène, the specialist for sensitive skin offers a wide and complete skin care range that cater to different skin types and concerns which I need to explore more. 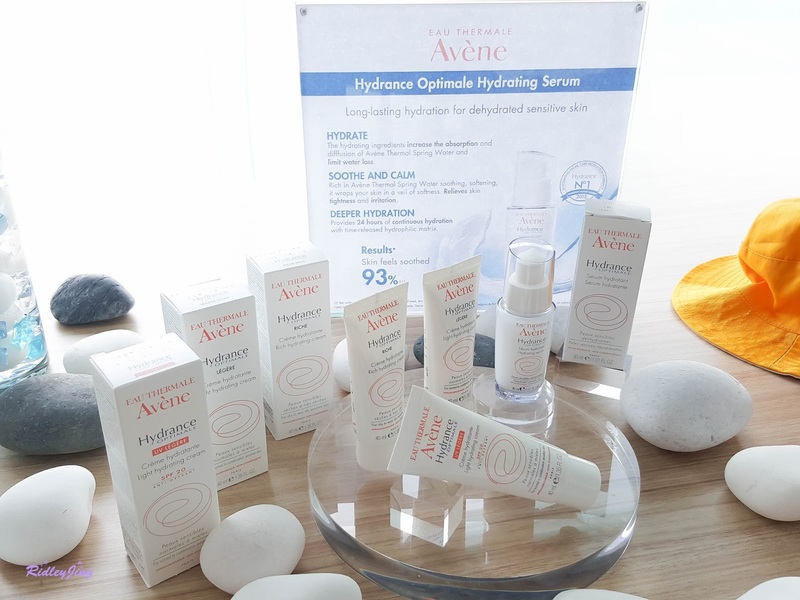 During the luncheon, I have the chance to discover more on the Eau Thermale Avène Hydrance Optimale, a Hydration range and the Suncare range as well as Avène Thermal Spring Water. During the luncheon, sharing session was given by the presenters as well as the special guest, Trisha Kuck on that day. Trisha was invited to share her experiences during her trip to Avène Hydrotherapy Centre in France. Listened to her whole experience really made me want to explore more of Eau Thermale Avène. Thank you Eau Thermale Avène for this amazing luncheon. Group Photo of the Day. After attending the luncheon, I was given a set of Eau Thermale Avène products to try at home. 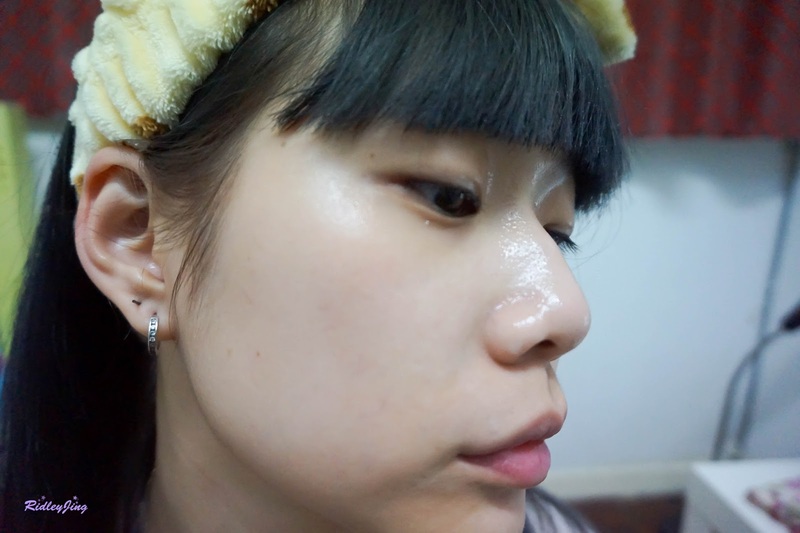 So for almost 2 to 3 weeks, I have been using Eau Thermale Avène products in my daily skincare routine as well as makeup routine. Guess what, the products were super awesome. 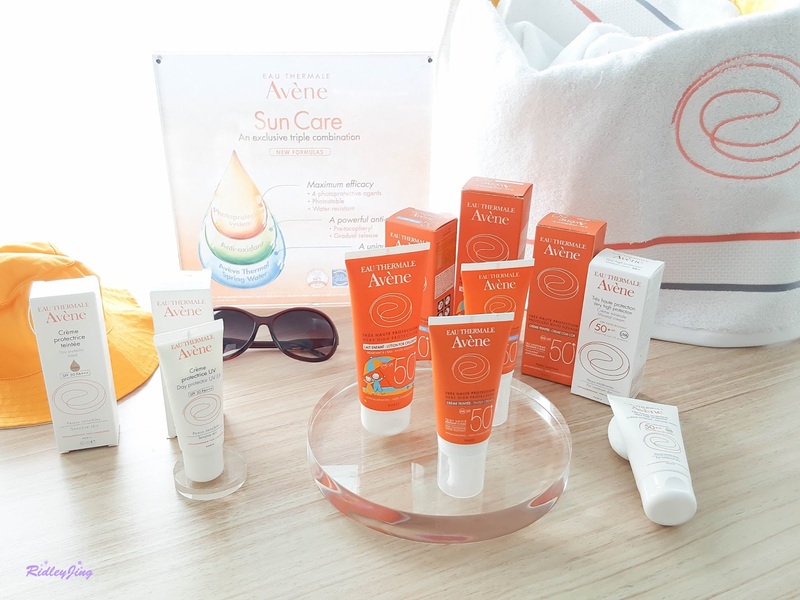 So, let’s just start my skin care routine with Avène products. This table is the Essential Care Skin Regime given by Eau Thermale Avène Team. 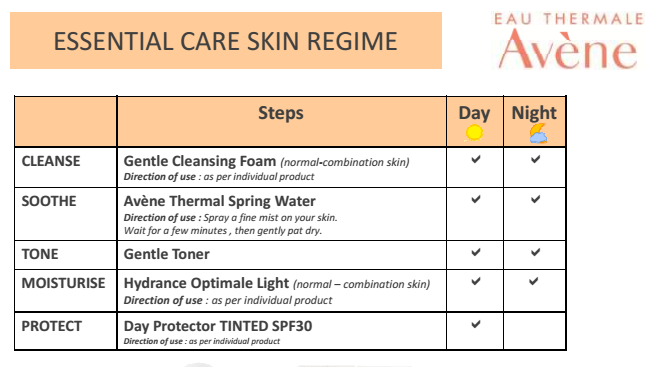 My skincare routine with the brand was also following this table as the table was very easy to understand. Firstly, cleanse your face by using Eau Thermale Avène Gentle Cleansing Foam 150ml. 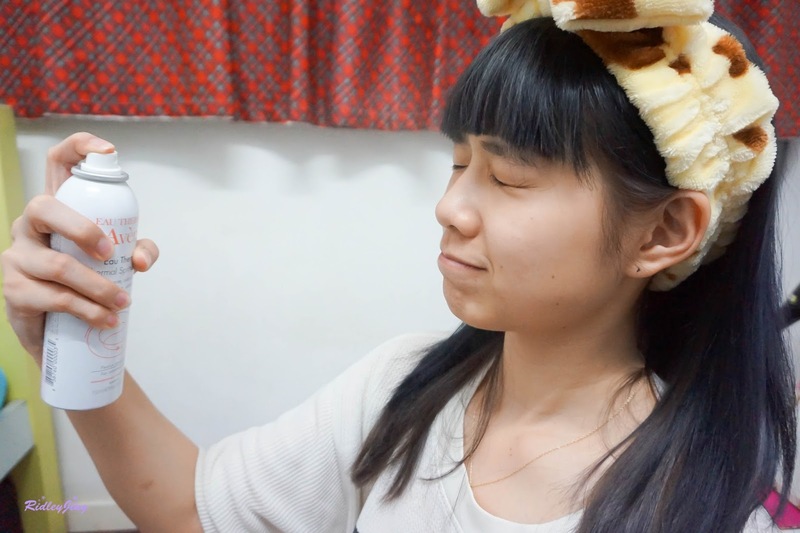 The Cleansing Foam comes out in a bubble form. I really like foam type cleanser because it can clean much better than any other form of cleanser. After finish cleansing your face, just simply wash it off with water. If you really want to have a better results, I heard that washing off the cleansing foam with Thermal Spring Water can really provide a better outcome. 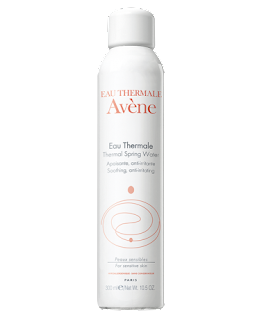 You can also use Avène Thermal Spring Water after cleanser and before applying toner by leaving in on your face for 2 to 3 minutes to form a protective film. 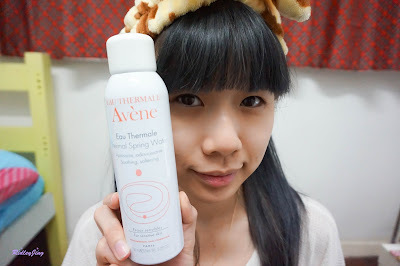 Next, spray the Avène Thermal Spring Water on my face! Spray it from distance so that the water mist can fully cover your whole face. 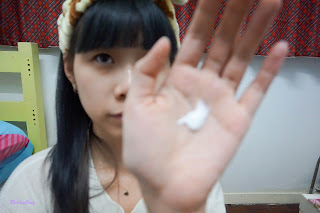 Let it stay on your face for few minutes, then gently pat until dry. 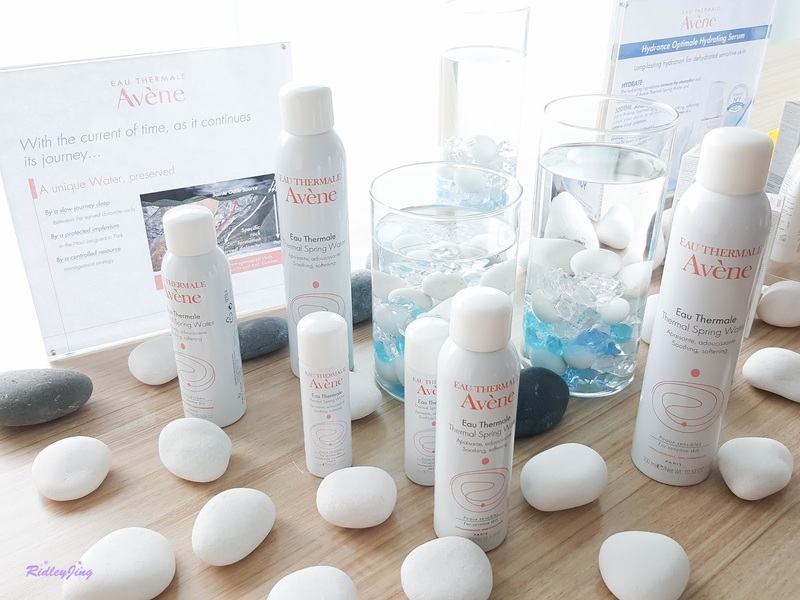 Since Avène Thermal Spring Water mainly helps in soothing and softening , it makes my skin feel much more refreshing and hydrated. Of course it won’t cause any irritation on your skin as the water is routed directly from the natural source to the production. This means that the water that came out from the bottle is really the spring water all the way from Avène village in France which the original properties and qualities of Avène Thermal Spring Water are present and found unaltered inside each spray. For people like me who always stay in air conditioned room, it’s really a good product to keep my skin stay fresh and hydrated all the time. First, shake well before use. 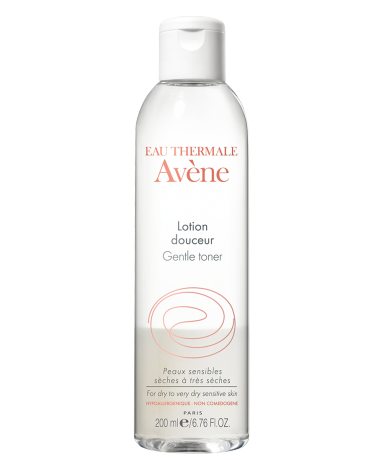 Next, apply Eau Thermale Avène Gentle Toner 200ml all over your face after spraying Avène Thermal Spring Water. It works like normal toner so you can always use it after face wash. Same to the other products, it won’t cause any irritation to your face as it is alcohol-free. 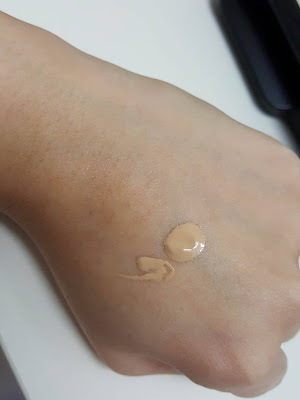 The product texture was quite watery and it’s a bit milky color. It also smells like some powdery kinda smell. Gently apply it all over your face and pat it gently until dry. 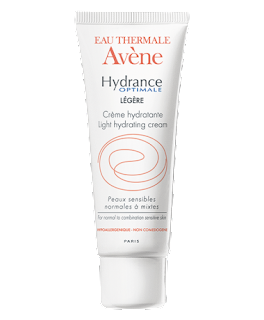 Next, apply the Eau Thermale Avène Hydrance Optimale Light Cream 40ml in five different spots on your face. 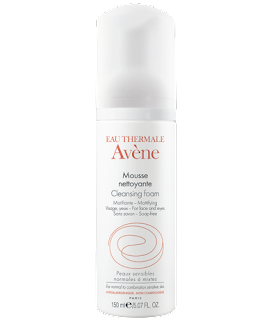 Eau Thermale Avèneintroduces a new active complex, Meiboserine that perfectly imitates the natural moisturizing protective film that keep our eyes surface moist all the time. This perfect model of protection for skin is now been introduced in Hydrance Optimate range that provides extra moisturizing treatment for your sensitive skin. so can you imagine how hydrating it is to our skin just like how our eyes always remain moist? 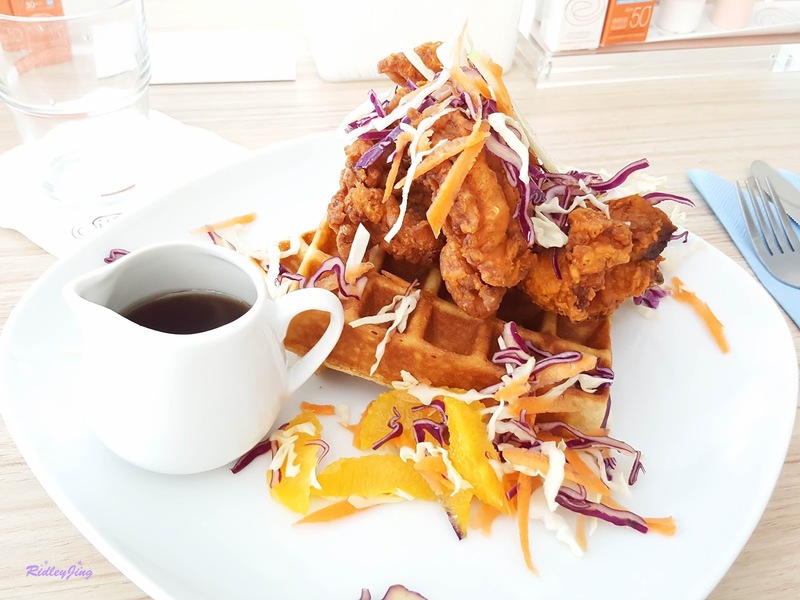 The texture of the product is white fluid and non-greasy emulsion. 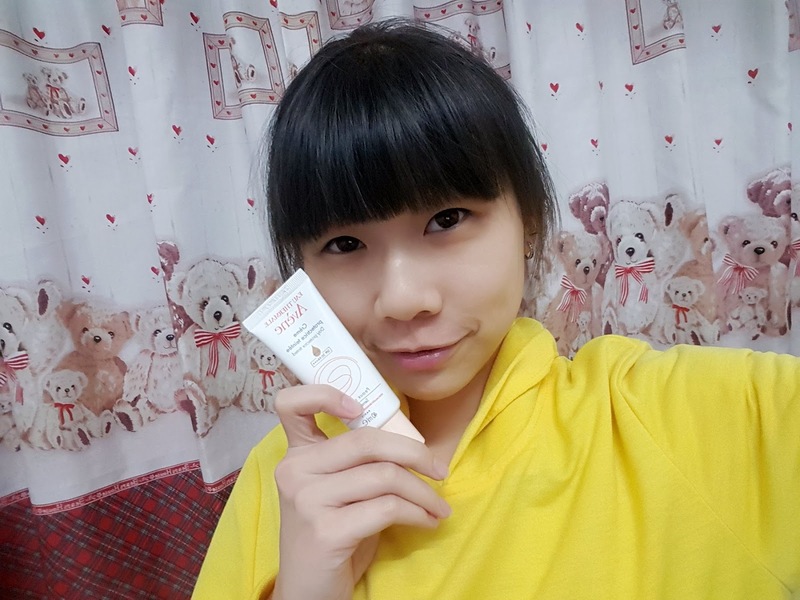 Gently apply this cream in different areas and massage over your face and it can be easily absorbed fully into my skin. This is my favorite product so far as it really hydrates my skin. My skin was a bit dry these few weeks as my office has super cold and strong air-conditioner, so the environment in my office is very dry. 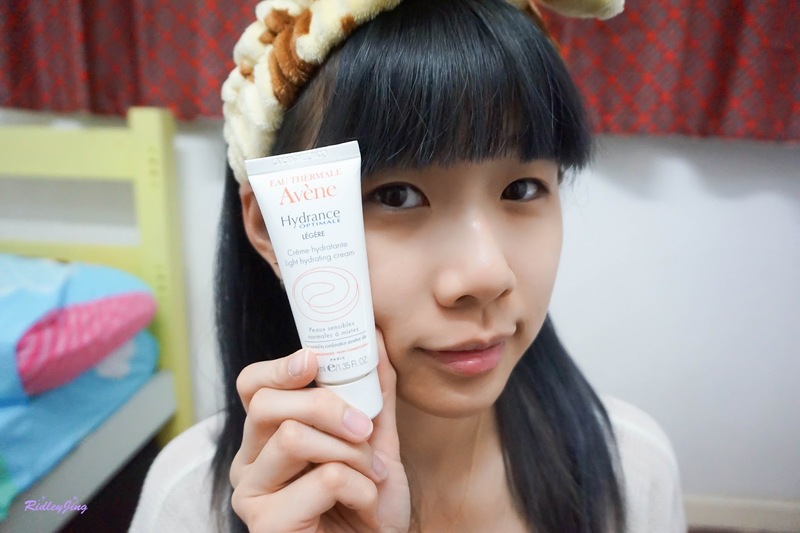 However, with Eau Thermale Avène Hydrance Optimale Light Hydrating Cream 40ml, it really rescues my skin from dryness. Next, the Avène’s Day Protector Tinted with SPF 30 PA +++. During day time, before go out under the hot sun, sun block is very important. Although many products or cosmetics comes with UV protector factors, it’s still not enough. Therefore, Sun Protector is needed separately to really block off most of the UV rays and sun lights. 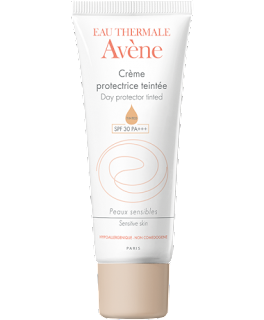 The texture of the Eau Thermale Avène Day Protector Tinted 40ml is something like BB Cream. It is tinted and lightweight cream that is easy to apply. 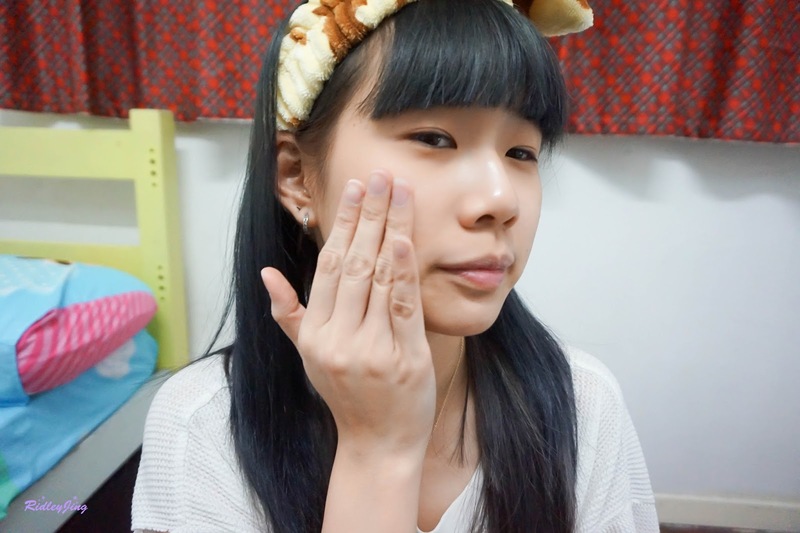 As you may see in the photo, the products color is like a BB cream color which you can use it as a make-up base. For this products, just apply it same as the way you apply your foundation. Apply it all over your face during you day makeup. After I blended it, you may see that the color becomes more natural. 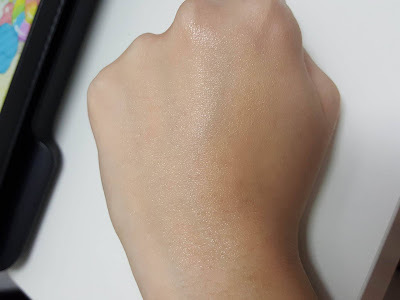 The texture after application is not oily nor sticky and is very light weight. Basically you don’t feel that you have apply a layer of sun protector. 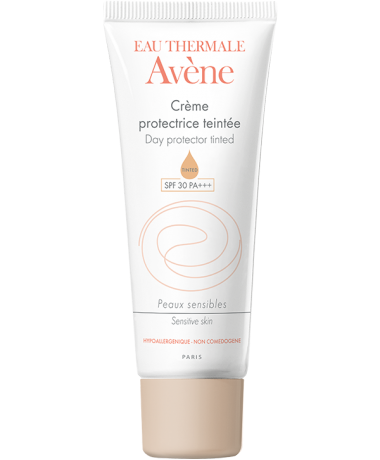 I highly recommend Eau Thermale Avène Day Protector Tinted 40ml to all of you , and as always, all Eau Thermale Avène products are suitable for sensitive skin, so you do not need to worry that the product will cause any irritation and uncomfortableness to your skin. 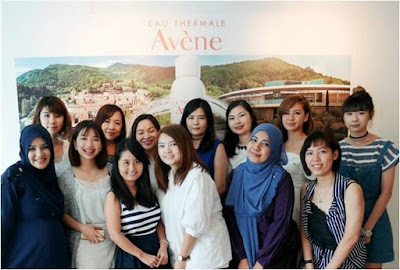 For these few weeks, I had switched all my skincare products to Eau Thermale Avène just because I really want to know how good are Eau Thermale Avène products. 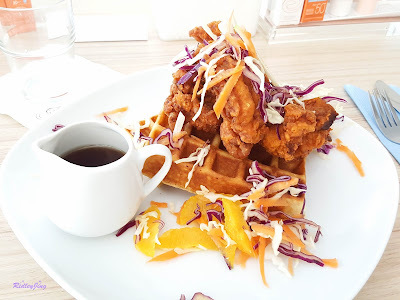 As expected, the products are really as good as what I heard and learned from the luncheon session. 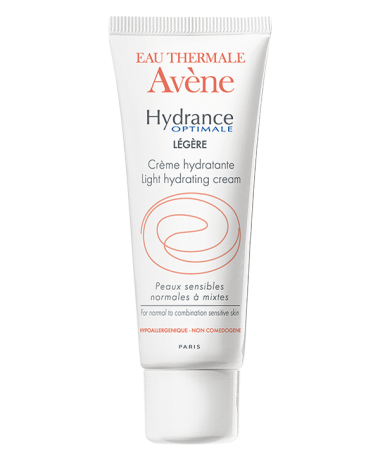 Now my favourite from Eau Thermale Avène will be the Hydrance Optimale Light Cream 40ml. 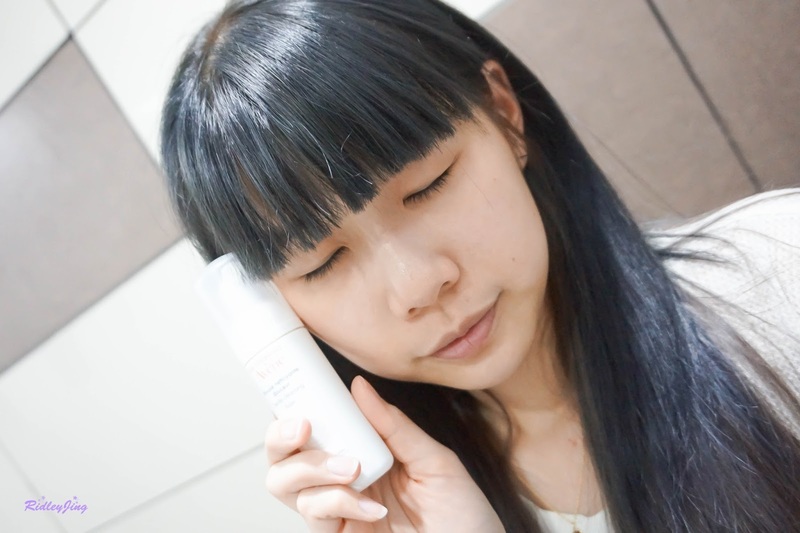 As I always concern more on hydration products, the Hydrance Optimale Light Cream 40ml is really a great product to save my skin from dryness. 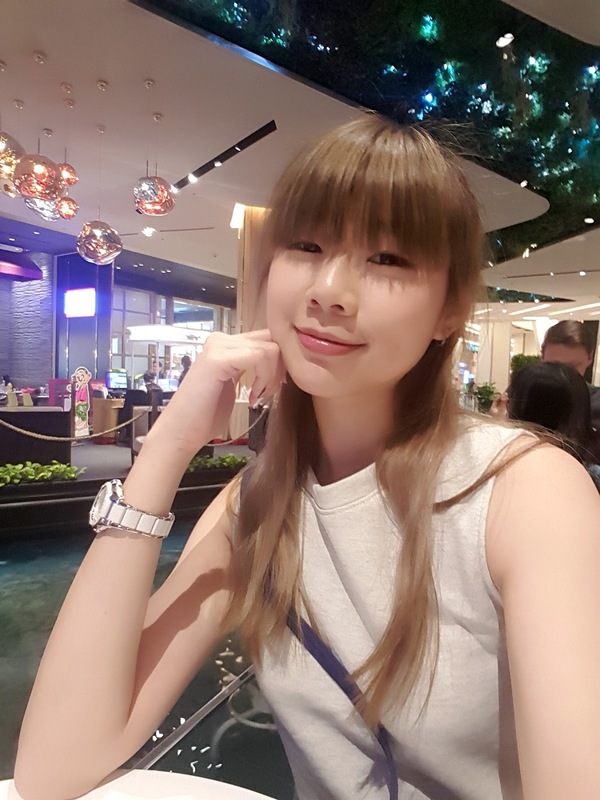 Hope you like my updates. I've heard good things about this avene termal su product. Going on my wish list now!